In January 2016 the Eurotunnel group decided to flood the landscape surrounding the Eurotunnel tracks and check-in facilities. Since the group owns the ditches, drains and their vortex control valves they decided to intentionally shut those in order to accumulate water surrounding the terminal. 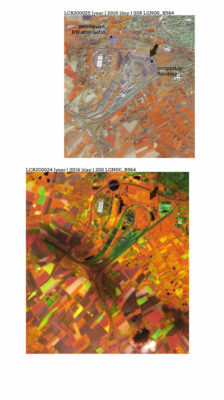 The above Landsat 8 images, published by NASA and manipulated by pnevma show the extent of flooding. A more detailed map with valve and ditch positions forms part of the field notes: Calais publication.